Now the weather is getting warm, it’s time to get outside and cleanup your lawn. Regardless if you have a small lot or huge acreage, you’ll need to do something with all that yard waste generated from your hard work. To make your landscape look its best, you’ll need a plan of attack to follow. It’s a good idea to learn which plants are non-native and/or invasive in your area so you don’t inadvertently introduce them to your yard. In addition, it’s best to learn what you should know about yard waste hauling so it doesn’t become a source of aggravation. If you’re a new homeowner or are new to single family home living, you’ll find that yard work is a regular need during the spring and summer months. It’s at this time to replace an old wood deck, and the time when most grass and plants come out of their dormancy. As these awaken, they begin to compete for the nutrients in the soil, sunlight, and water. There are some steps you can take to help reduce the amount of work necessary to keep your lawn looking great. Know what yard waste is and isn’t. Most municipal waste collection agencies restrict what is suitable for pick-up. 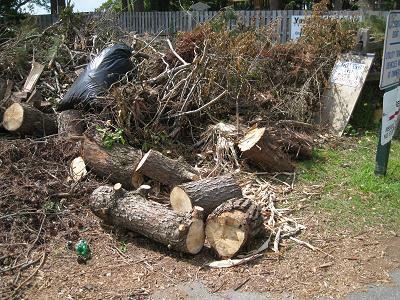 For instance, lawn clippings, branches, and leaves, are generally considered to be yard waste. However, other landscape elements are not yard waste, such as fencing, hardscape features like fountains and rocks, pressure treated wood and so on. Keep these separate for easier disposal. Prevent water from becoming a problem. If you mow your front yard and backyard, you’ll probably dump the grass trimmings into a large container. It’s a good idea to drill small holes into the bottom to keep water from increasing the weight. In addition, cinch the lid down tight to keep pests from getting into it. Be sure to bundle branches together for easy disposal. When you trim a tree, cut the branches down to approximately four feet long, and bundle them together with twine in small, easy to carry bundles for easy disposal. Keep the soil for yourself to reuse elsewhere in your landscape. If you have potted plants that have died and want to dispose of these, you ought to consider keeping the pots and the soil to reuse elsewhere in your landscape. If you are doing some serious yard work or putting-in an entirely new landscape, phone 800-433-1094 or visit Junk Garbage Removal for all your yard waste hauling needs. We have locations all over the area and one nearby you to help out when and where you need it.